Loryn: I love working with wool felt, and one of the best ways to get it inexpensively is to felt wool sweaters from the thrift store. 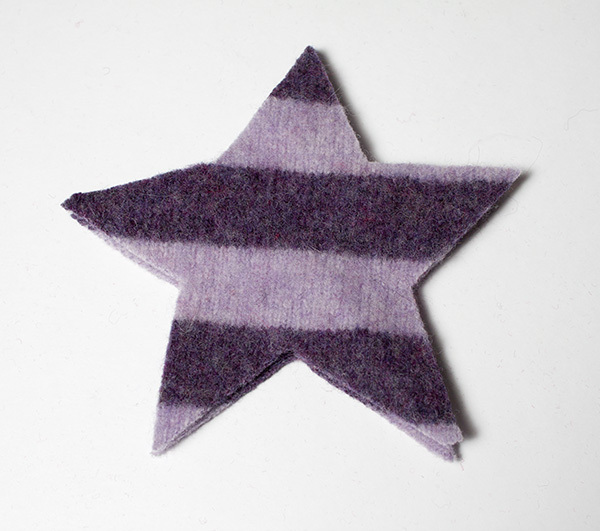 After I made the Felted Wool Stockings, I had lots of small pieces of felt left. Cheri and Kristin’s Ornament Countdown inspired some wool felt ornaments. 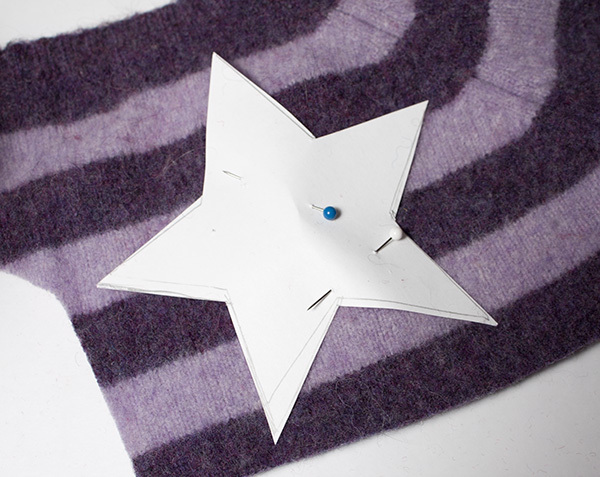 I cut three simple star shapes from card stock and used them as a template. 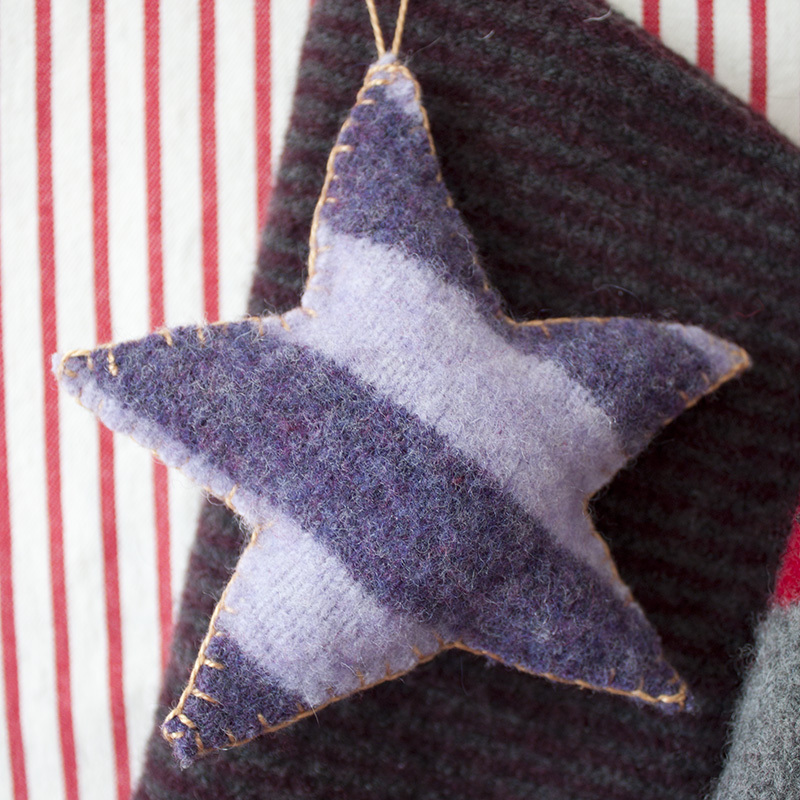 Click here for a PDF Star Ornament Template that you can download. For your first step, layout your template. If you have a patterned fabric, play around with the direction of the pattern to find one that you like best before pinning. 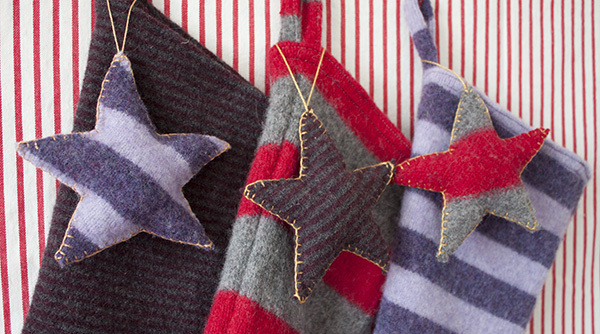 Cut two of each piece, and you’re ready to start stitching. I used No. 6 pearl cotton thread in a yellow gold color. Sew with a single strand, and use a much longer piece of thread than you think you will need. 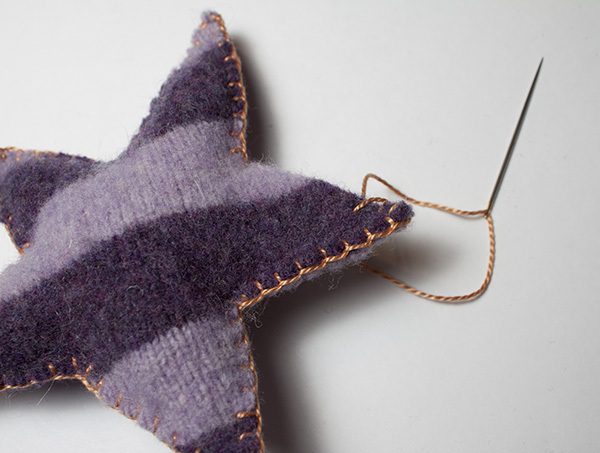 For your first stitch, start on the wrong side of your top star and bring the needle and thread through to the right side. 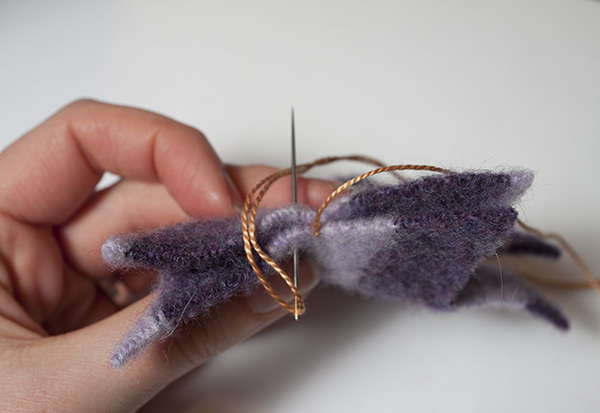 Wrap the thread around the edge, bring the needle through in the same spot, and draw the loop snug. All of the stitches will be started from the front side of the stars. Try to space them evenly, but don’t worry about being perfect. 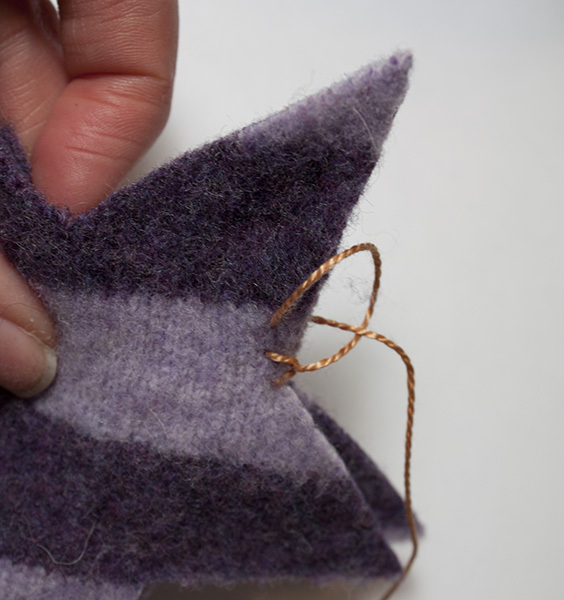 To make the blanket stitch, insert your needle, bring the thread around the needle, then pull it taut. Essentially, you’re making a knot on the edge of the fabric. 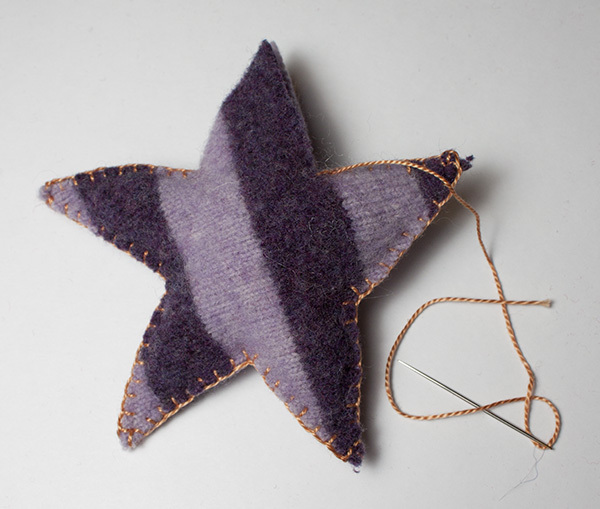 Pull it snug, and repeat the stitches until you get to the point of the star. To sew the points, make three stitches by bringing the needle up at the same spot each time, one stitch on the right side, one at the point, and one on the left side. Keep stitching until you’ve finished four of the five points. It’s easier to stuff the finished points and main body while one point is unsewn. I used plain old polyfill, leaving the fill really loose. Small leftover felt scraps also make good stuffing material. Stitch the remaining point, leaving a small opening to stuff the final point. 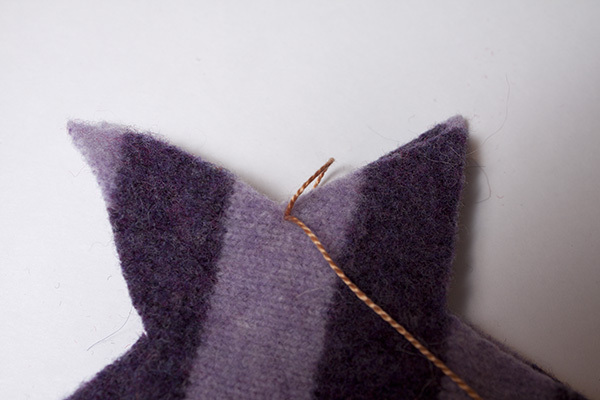 Once it’s stuffed, finish sewing the seam and make a knot with your needle. Don’t cut the thread yet, though. Run the needle through the inside of one of the arms, and bring it out at the point where you want to put the hanging loop. 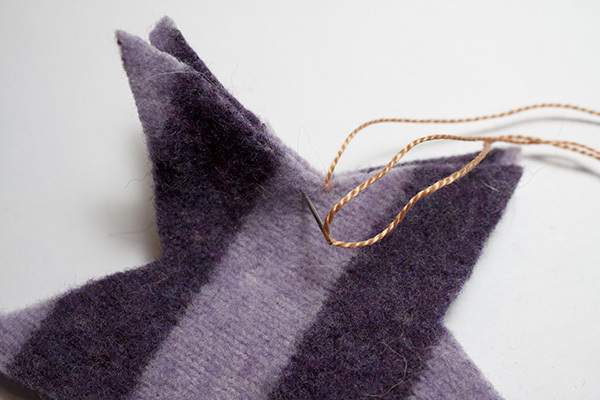 Make a knot, measure out a hanging loop, then make two more knots to finish the hanging loop. Hide your thread, and you’re done! This process would work great for all kinds of shapes, like trees, bells, or circles, and they look great hanging on matching stockings! 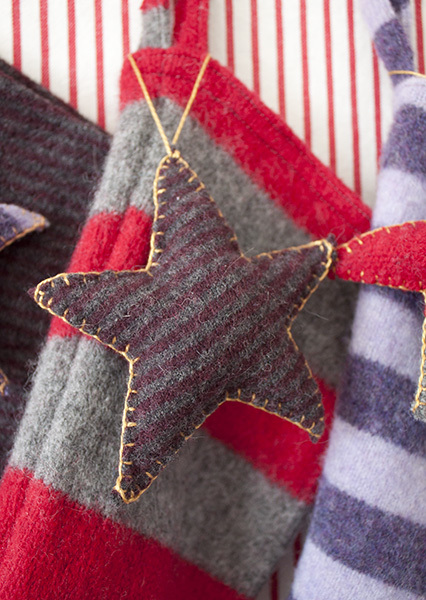 The stockings and the stars look so good together.